The truth is, all major appliance brands offer nearly identical refrigerators. The new models you’ll see today are far more energy efficient than those produced even five years ago, and repairs are only as difficult as finding the nearest technician. So, how do you choose what’s right for you? First, you’ll need to measure your space, then figure out the refrigerator style and size best for your lifestyle. Don’t worry — we’ll show you how. Fridges vary by height, width, and depth, and it’s important to know exactly what size you need to be looking for. Too large, and you risk not being able to fit your new fridge through the kitchen door, let alone fit it inside your kitchen. Too small, and it might look out of place. Depending on the amount of space available, you might find that certain types of refrigerators won’t work for your space. If you are working with a small space, your most likely option will be a top freezer. If there is only a narrow gap between your refrigerator and your kitchen island, however, a refrigerator with two doors will make it easier to reach in and grab the carton of milk without hitting the door on the cabinetry. After height and width, the most important measurement you’ll need to note is depth. Most fridges are not counter-depth; most counters are 26 inches or shallower, while most fridges stick out at least two or three inches beyond that. If you prefer your fridge to blend in with your counters, look for counter-depth refrigerators. These typically have less space to hold food, but won’t stand out from the rest of your kitchen. After factoring in physical constraints, choose your fridge based on the features that are most important to you. Top freezers are the most economical refrigerators, but don’t look particularly fancy, and usually don’t come with ice or water dispensers in the door. French door refrigerators look like they belong in Martha Stewart’s kitchen, and typically have nicer glass shelving options and drawers. That said, they tend to be among the most expensive of the refrigerators. Bottom freezers look fairly attractive, typically coming in stainless steel finishes, and are user friendly. By tucking away frozen foods at the bottom, they keep your everyday food at eye and hand level. This can make it more difficult to dig up your frozen peas, however, though some models come with freezer baskets to help organize the space. Side-by-side refrigerators usually take up more space in your kitchen than other styles, in exchange for giving you more freezer space than with any other type of refrigerator. The freezer space tends to be slightly narrow, making it difficult to fit in large pizza boxes. 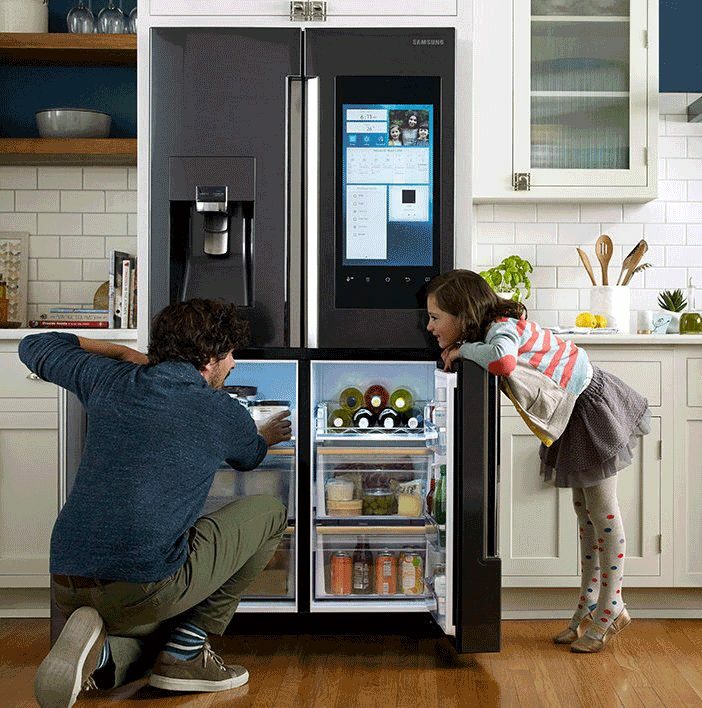 When it comes to refrigerators, bigger is not always better. Your ideal fridge size depends first on your available kitchen space, and second on your household size and cooking preferences. In general, you should estimate between four and six cubic feet of storage for every adult in your home, or around 20 cubic feet if you have a family of four. If your family makes a lot of home-cooked meals, or keeps a large stockpile of frozen or fresh food, you err on the size of larger, rather than figure out where to house a second freezer later on. One of the most important aspects of purchasing a major appliance is determining where you can repair it. We hope that our fridges will run smoothly for at least ten years without repair; however, if your fridge won’t stay cold or your circuit breaker trips frequently, having a repair shop handy can be the difference between $130 service call and replacing your fridge entirely. Most manufacturers have refrigerator service centers across the country, and each company maintains a search page to help you find the one closest to you. You’ll want to especially keep an eye out if you’re looking at either a LG or a Samsung refrigerator. These brands started in South Korea, which means that they have been slower to set up service centers nationally in the states, and many repair technicians will refuse to work on them if they lack the expertise. One Day Design is kinda vanilla. You ought to glance at Yahoo’s front page and see how they create news titles to grab viewers interested. what you’ve got to say. Just my opinion, it could bring your posts a little bit more interesting. Hi there! I could have sworn I’ve been to this website before but after looking at a few of the posts I realized it’s new to me. I visited several web sites however the audio feature for audio songs current at this web site is genuinely fabulous. annoyed at the same time as people consider worries that they plainly don’t realize about. I surprise how much attempt you set to create such a excellent informative website. Helpful information. Lucky me I discovered your website unintentionally, and I’m stunned why this coincidence didn’t took place in advance! I have absolutely no expertise in coding but I was hoping to start my own blog soon. Anyhow, if you have any suggestions or techniques for new blog owners please share. learn many new stuff proper right here! Good luck for the next! sources back to your weblog? My blog site is in the exact same niche as yours and my visitors would truly benefit from a lot of the information you provide here. Superb, what a blog it is! This web site gives helpful facts to us, keep it up. It’s truly very difficult in this busy life to listen news on TV, so I only use world wide web for that reason, and get the hottest information. web page conations genuinely good funny material too. in fact good and the users are in fact sharing nice thoughts. Good response in return of this difficulty with firm arguments and describing all about that. Rest assured that the Oklahoma City property managers is pretty good at distinguishing fake in the genuine ones. the brand for the favored team onto the court as well. Every weekend i used to pay a visit this web page, as i want enjoyment, as this this site conations actually good funny material too. the posts are very quick for novices. May you please extend them a little from subsequent time? range of instruments generating several forms of melodies, they’re usually the most skilled inside the music industry. you are truly a just right webmaster. The site loading pace is incredible. It kind of feels that you are doing any distinctive trick. Furthermore, The contents are masterwork. you have performed a wonderful process in this topic!